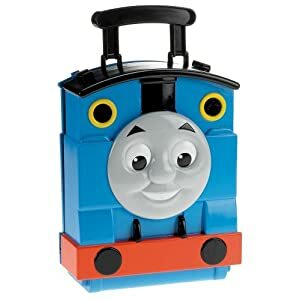 New Thomas and Friends’ Tote-A-Train Playbox – Playset and Storage in One! Have a little Thomas & Friends fan at home? If your child uses the Take Along Engines, they’re going to adore Fisher-Price’s Tote-A-Train Playbox ($15.00 -16.99). It doubles as storage for up to 10 trains and a portable playset, with a fold-out track. It’s great if you have a lot of trains strewn around your home, like I do and it’s also perfect for trips to Grandma’s house. We like the easy-to-grasp handle for little hands. And yes — it connects to other Take-n-Play playsets! Should not be used for children under 3 (choking hazard) and it does not include any engines. My son had a ball testing this one out — he’s a huge Thomas fan. If you have trains that belong to a different Thomas series (like the Wooden Railway), they are not going to fit. What will fit: Take Along Trains (last year’s discontinued series from Learning Curve) or Take and Play Engines (Fisher-Price). Get it on Amazon for $16.99 for with free shipping. Thank you to Fisher-Price for providing a sample for review purposes.